The word angel comes from the Latin word angelus meaning 'messenger'. In a sense, an angel is an intermediary between the physical and the spiritual worlds. The concept doesn't belong solely to the Christian tradition. In fact, it's common to find beings who guard mankind and carry out the wishes of a higher being in most of the religions across the world. Islamic and Judaic traditions, Sikhism, and neo-Hindu religions are filled with stories of the deeds of angels. Many early Christian books have put forward the theory of different types of angels, each of which performs a certain task. The Angelic Choir refers to the hierarchy of angels and not to the image of attractive beings with wings singing hymns. According to various ancient texts, the Angelic Choir consist of the Seraphim, the Cherubim, the Ophanim, The Virtues, and the Archangels. The Seraphim are Heaven's administrators who herald God's praises and make sure that everything is in order. The Cherubim are the guardians, while the Ophanim execute God's justice and authority. They are closely related to the Virtues, who are, in essence, high ranking Ophanim. The Archangels are the head honchos of the Angelic Choir. Some sources make ambiguous mention of other classes of angels and it's unclear whether they are referring to heavenly beings or finding subtle ways of speaking about the various branches of Government of the time. Many ancient writers had to find clever ways to mask their criticism, and praise, of the social systems of the time in order to avoid persecution. There are countless variations to the traditional image of an angel. The meaning of each concept depends on the type of elements that you choose to incorporate into the tattoo's design. Although the traditional role of the Cherubim is to guard and protect, most Cherub or Baby Angel tattoo designs represent Innocence. Persons with these tattoos often use these images to represent a child in their life that has passed on. The Bible never refers to angels that look like cute little babies; the concept of a childlike Cherub comes from artworks in the Middle Ages. The true image of the Cherubim is fearsome and awe-inspiring. The childlike image may have originated out of some confusion with another popular concept at the time, the Putti. A Putto is a toddler with the wings of an angel who, according to the Greek and Roman traditions from which it originated, is capable of influencing humans. Cupid is a popular example of a Putto. Cherubim are usually shown as being playful or as Sleeping Angels. Also see Cartoon Angel tattoos. Fallen Angel Tattoos represent the Loss of Paradise. In a sense, wearing this design means that you've lost something or someone close because of your actions. The most famous fallen angel, Lucifer, lost his seat as a high ranking Archangel after he led a rebellion against God. His actions resulted in him being cast out of Heaven. Fallen Angels are often shown as having a broken wing and a look of shame or regret. This design is similar to the Gothic Angel tattoo design and the two are interchangeable. A Flying Angel tattoo symbolizes Resurrection and Rebirth. The image is most often seen in cemeteries and is a throwback the Resurrection and Ascension of Christ. In a sense, bereaved family members expect their loved ones to be resurrected during the Rapture and this has many similar overtones to the Apocalypse scenario described in the book of Revelation. "...the dead in Christ shall rise." 1 Thessalonians (4:17) Flying Angels are sometimes shown with a trumpet which also symbolizes Resurrection. By wearing a Flying Angel tattoo, you're identifying with Rebirth and Renewal, especially after a traumatic event. Angel Wings symbolize Freedom, Protection, and a need to be closer to God. Persons who wear this design have a strong spiritual connection and the condition of the wings speaks to you relationship with God. A damaged or broken wing is reminiscent of a tattered connection with God and an internal struggle that has led your to doubt your faith. 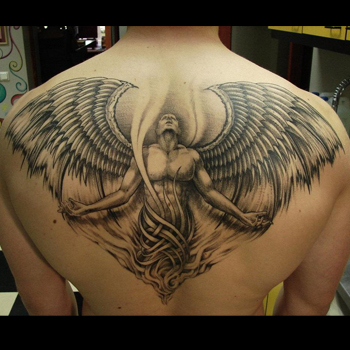 Tribal Angel tattoos embody a mixture of Christian and Non-Christian traditions. Tribal patterns have spiritual meaning that relate to the indigenous culture of various regions worldwide. These tattoo designs symbolise a strong connection to God and the spiritual elements, as well as a strong bond with your local culture. Celtic Angel tattoos are deeply rooted to Spirituality and a link with the Irish culture. These tattoo designs symbolize a close bond with God and the Catholic Church, since Irish culture has strong connections with this denomination. While Gothic and Fallen Angel images have similarly dark undertones, there are distinctions between the two. A Gothic Angel is never shown as being injured, with one wing, or with broken wings and they usually have defiant poses. On the other hand, the Angel in a Fallen Angel tattoo design is usually hurt and looks ashamed. Both tattoos have different meanings; a Fallen Angel tattoo expresses some form of punishment for your misdeeds, whereas a Gothic Angel tattoo is a tip of the hat to your rebellious and defiant nature. There are those in the Angelic Choir who are charged with the task of protecting mankind. According to the Biblical tradition, Guardian Angels are the Cherubim, but most designs tend to use the imagery of the powerful Archangels than a few playful Cherubim. Let's face is, a Cherub doesn't strike fear into the heart, does it? An extension of a Guardian Angel tattoo is the Angel with Baby design. These images usually relate to the intimate bond between a mother and her child rather than the more general 'protecting everyone' vibe of the typical Guardian Angel tattoos. Also see Warrior Angel Tattoos. These designs are another expression of the Guardian Angel series, but the meaning of the two vary to some extent. A Guardian Angel is associated with Protection, whereas a Warrior Angel is ready to battle. These images relate to conquering evil rather than protecting the innocent. Popular images of Warrior Angels depict the Archangel Michael, since he's often mentioned in the Bible as 'leading God's armies'. Photo courtesy of www.tattoo-wallpapers.com A Praying Angel tattoo symbolizes your need to connect with God, since, according to the Biblical tradition, prayer is how mankind communicates with God. In essence, you are seeking guidance, protection, or asking for divine intervention with an issue. Several Archangels are referred to by name in the Bible, but the most popular are Michael and Gabriel. Each Archangel is concerned with a particular task, but all hold a seat of power in the Angelic Choir. Archangel tattoo designs are often linked with Guardian Angel and Warrior Angel tattoos, since they are often shown defeating the enemy. The Angel of Death (also known as the Angel of Destruction) appears in many religious traditions throughout history. In tattoo designs, it is meant to symbolize both Fear and Death. Persons who wear Angel of Death tattoos are sending a message that they shouldn't be taken lightly as they identify with the strong emotions that impeding Death and Doom evoke. An extension of the Baby Angel designs. Cartoon Angel tattoos represent Innocence and Frivolity, and are a fun twist to the more traditional image of a Cherub. The influence of the Japanese culture is undeniable, especially in the world of tattoos. Manga and Anime Angel tattoos are a blend of numerous Japanese themes and Biblical traditions. In Anime cartoons, characters with angel wings are often warriors and lone rangers, who have been rejected by the society that they are trying to protect. Anime and Manga Angel tattoos that focus on female characters tend to have sexual undertones, since this is a general feature of the genre. Breast Cancer Angel tattoos are almost exclusively worn by women and incorporate the pink ribbon logo to build awareness for those fighting against Breast Cancer. These tattoos represent Hope and Rebirth after the devastation of suffering from the disease. It is often worn by Breast Cancer survivors and their loved ones, and is a memorial to loved ones who have lost their battle with the disease. An Angel Butterfly tattoo design has spiritual significance and symbolizes the protection of Innocence. Persons who wear this tattoo design usually see themselves as the angel and tend to be protective of a close friend or loved one who's emotionally or spiritually fragile. Pin-up girl tattoos first became popular during WWII. These tattoos feature a mix of 'Naughty and Nice' and symbolize Temptation and Desire. It sends a powerful message, since a concept that is overtly sexual is intertwined with a religious image. No wonder one of the most successful marketing and product campaigns by Victoria's Secret is it's Angels Collection. Figuring out which tattoo design is right for you depends on what your new tat will symbolize and where your want to put it on your body. "What variation of the design best fits my personality?" If you need some inspiration, then visit our design page at www.itattoodesigns.com or take advantage of our Custom Design Service, where our team can design a truly unique piece for you.